Welcome to Isabelle's Blog: Happy Birthday Daniel! 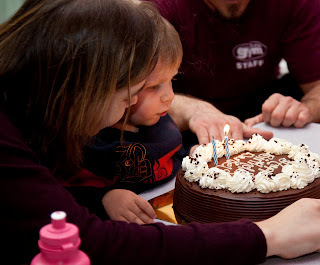 Daniel just turned 2, and we had a great birthday party for him. It was our first birthday celebration for him as we felt he was too young to enjoy his birthday last year. This year was another story. 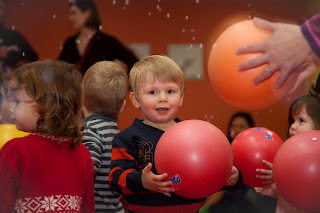 Daniel has a lot of friends that he loves (primarily from daycare), and he is very involved whenever we have new activities for him. 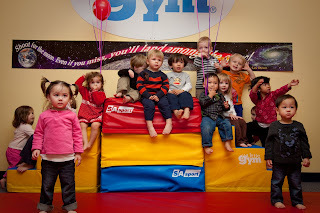 We decided to organize his birthday party in a gym, offering a variety of activities. 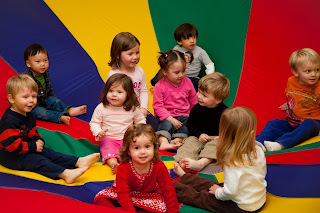 We had attended similar birthday parties in the past, so we knew this should be a hit. And it was! The program included a mix of free play in the structure around the gym (trampolines, bars, big bolsters) and dancing/singing/activities moderated by a teacher. I was very impressed by the ability of the teachers to offer a variety of activities - and at the right pace- that were perfect for 2-4 year olds. 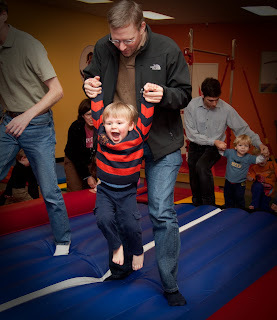 All kids had a lot of fun, and I think most of the parents enjoyed it too. Daniel was so happy the whole time. From the minute he saw his friends arrive (he was so excited he started dancing and clapping without even any music) to the good-byes, he was great. He went with the flow of activities, and enjoyed each of them fully. The pace was so appropriate that he didn't complain when the program stopped. He had used up all his energy and was still happy but ready to go home. Overall, we can really recommend this solution, especially for winter birthdays that have to be organized indoors.